The Sonido Blue Digital Listener provides bespoke volume and tone control for users with hearing difficulties. The portable device is ideal for use both in public and in the home, and is compatible with a range of personal listening accessories and T-coil hearing aids. The Digital Listener is compatible with a wide range of personal listening devices. In order to benefit from the custom sound settings provided by the listener, a listening device must be used alongside the unit. Options include neckloops, headphones, stethosets, and ear hooks. The listener is also suitable for T-coil hearing aids. It plugs into the neckloop or earhook to transmit amplified sound to the hearing aid for optimal audial control. With an extra microphone on a five-metre lead, the Sonido Digital Listener is ideal for enhancing the experience of watching television. By placing the microphone beside the TV, sound can be adjusted for the individual without affecting the volume for others in the room. The listener also provides the option to mute background noise so that the TV audio is the only sound sent to the ears. The ability to turn off this setting at the push of a button will be practical for anybody wishing to talk to another person in the room, meaning everybody in the home can benefit from the listener. An additional TV Kit can be purchased separately to plug directly into the TV. In addition to being a great device for use around the home, the Digital Listener is also perfect for improving sound quality when outdoors and in public. It can often be difficult to hear speakers or fully understand speeches in meetings; whether the wearer is hard of hearing or is simply looking for crisper, clearer sound when at the back of a room, the Digital Listener can offer an improved listening experience. 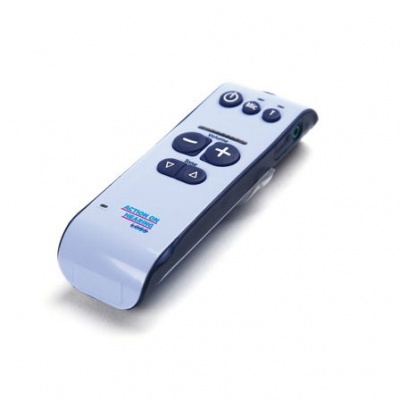 As the Digital Listener features a rubberised coating for easy grip, and large raised buttons that offer soft-touch application, the device can provide optimal volume and tone control in any situation. With up to 150 hours of battery life, it is the ideal listening accessory offering reliable and long-lasting enhanced listening. Please note that a personal listening device is required to use the Sonido Digital Listener. Compatible devices include neckloops, headphones, stethosets, and ear hooks.